I completed my yoga teacher training in Nicaragua almost one year ago. It's surreal to think how such an impactful event in my life has come and gone so quickly, yet I think about it all the time. The effects of this training on my life rolled through with such great force, and I still find myself stepping back and reflecting on how my life has changed since then. In September of 2015, I felt constricted. I didn't feel like I was moving forward in my career, so instead I poured all of my creativity into my blog and song writing. Writing has always been such a therapy to me. Through my writing, I came to the conclusion that I needed an abrupt change - Change that only I was able to put into motion. So, the next day I quit my job. 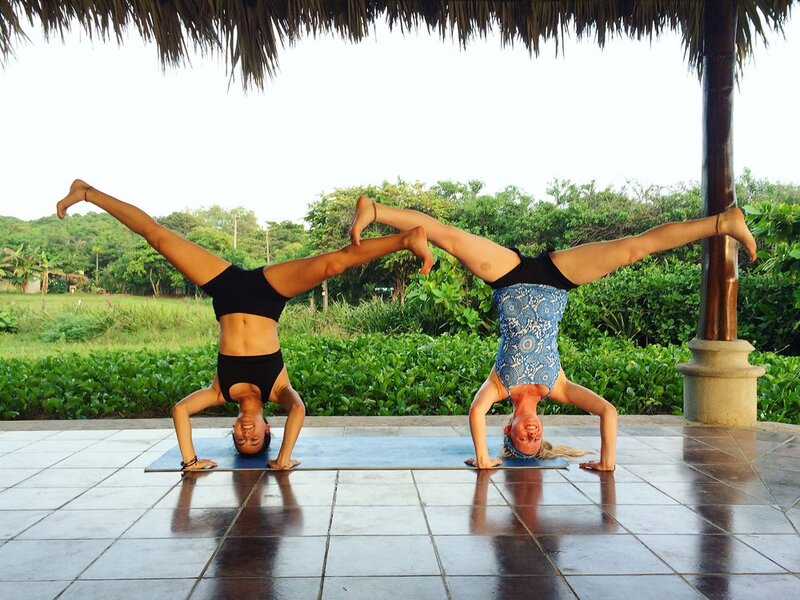 A few days later, I enrolled in a one-month intensive in Nicaragua for my 200-hour Yoga Teacher Training (YTT). This will forever be one of the most rewarding decisions of my life. Sometimes flying by the seat of your pants IS the answer. 1. What do you ultimately want out of this training? Of course, it's wonderful if you are training, because you want to be a yoga teacher. But, perhaps you are just looking to deepen your practice and explore your spirituality. This is an equally valid reason to do a training. It's up to you how you want to spend your money - just make sure you're in it for the right reasons. 2. How has yoga impacted your life? Think about what yoga means to you. Do you feel overwhelmed with passion, curiosity and the desire to grow your practice? Yoga has to be more than just an after-work exercise. It is a way of life, and there is an incredible community behind it. If yoga is something you LOVE and want to share with others, then you're on the right track. 3. Do you have a regular yoga practice both at home and in-studio? If you're interested in teaching, you need to have a solid yoga foundation to work from. A regular yoga practice is necessary to keep up with the pace of the training. Plus, if you've been practicing for a while, then you've had time to develop the passion, which will ultimately inspire you to want to teach. You'll be a better teacher, the more you practice and evolve as a student. 4. Is the timing right for you? Timing is very important. First, decide what kind of program is right for you, whether it's a 30-day intensive or a program that lasts a few months and is spread out over several weekends. For me, I was looking for a reset. I wanted to get out of NYC and completely immerse myself in the training, so an intensive in Nicaragua was more my style. Not everyone can take a month off, though, so do whatever suits your life at that moment. Also, ask yourself if you have the time to dedicate to practice teaching once the training is over. It's much easier to jump right in after the training, while you're feeling fresh and empowered. 5. Is the program Yoga Alliance Certified? It's not mandatory to be YA certified to teach. There are definitely gigs out there that do not care or even ask. However, if you're going to shell out between $2500-$4000 for a training, you might as well make sure it's YA certified and enroll post-graduation. Registration is around $100 for the year, which is a small contribution to make considering you've already spent thousands. I would recommend it - plus, you get some nice discounts and perks within the yoga industry. There are many things to consider when deciding on a YTT. Do lots of research. Read reviews. Stalk past-students of programs you like on Instagram and blaaaaast them with questions! Also, consider what's included in the program. My training with Radiant Life Yoga School at El Coco Loco included housing, DELICIOUS food, a few fun activities like surfing and horsebacking riding, and the opportunity to volunteer within the community (this was actually what sold me on the program). I completely fell in love with the children! I didn't come back to New York with just a yoga teacher certificate. I came back with a new family and a reignited passion for what I love. While I was there, I was hit with so much inspiration, it quite literally funneled out of me and straight into my journal. I wrote lyrics for seven songs, and came back with a complete strategy for how I was going to market my lil blog. Flash forward to today: I'm freaking focused like laser. I'm doing what I love with the ones I love, and that is seriously all I could have hoped for. Everyday I'm challenging growth in all areas of my life, and I'm learning so much along the way. Thank you all for your support - I blog, because I love connecting with you and supporting you, too. So, if you have questions, ask away. Let's get coffee. Share your stories. All of it inspires me, and I'm very grateful for you. Follow me on Pinterest! I'm really getting into it now, hehe.